I grew up in a baseball family, enjoying Daddy's season tickets on the third-base line at Griffith Stadium. Back then, Washington, D.C.,'s team was the Senators -- "First in war, first in peace and last in the American League" was the famous saying. Now, the district has a championship-caliber team, the Nationals. I rooted passionately for a Nationals-Astros World Series this year, and for a very personal reason. So, this column is an indulgence. My late father, Bo Bregman, was a sportsman of a certain prominence in Washington. My brother, Stanley Bregman, was the Senators' lawyer before the team moved cities and became the Minnesota Twins. If the name Bregman sounds familiar, it should. 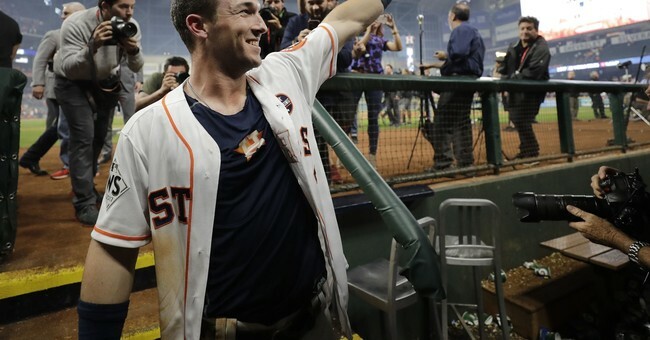 Bo Bregman's great-grandson, Alex Bregman, plays third base for the Houston Astros. His father, Sam Bregman, played baseball at the University of New Mexico. The family, like Alex, had a great Series. In the fifth game, Alex hit a stunning single to left field in the bottom of the 10th inning, the winning run that put the Astros on the cusp of a championship. They won that championship in the seventh and decisive game Wednesday night in Los Angeles. My father was a standout catcher in the Washington amateur leagues early in the last century. My brother Stan thought he might have made it to the middle minor leagues. He didn't, but he organized a sandlot team when I was a little girl. Daddy supplied bats, balls, gloves and shirts for the Bregman Wildcats, emblazoned with a ferocious wildcat. My girlfriends and I got T-shirts identifying us as the Bregman Kittens. We purred, contented. Bo's great-grandson was a natural from the time he was a little boy, special at four years old. And in high school, he won a national award for high-school player of the year. He played three years at Louisiana State University, and the Astros picked him in the first round of the 2015 Major League draft. My father didn't live long enough to know Alex, but he would have popped his vest buttons if he had seen him step up to the plate at his first World Series. Alex's extended family of first and second cousins, great- and great-great aunts and uncles (and friends) kept a steady traffic of emails, texts and telephone calls going, sometimes referring to him as a chip off the old block of his great-grandfather. Bo grew up in a different America. He earned his advanced degree at the unforgiving School of Hard Knocks. His was the immigrant Jewish experience, which you don't hear much about anymore. He dropped out of school in the sixth grade when his parents, who'd arrived in America as poor as synagogue mice, told him one day there was no money for a pair of shoes and he would have to wear his sister's shoes to school. "How could I wear girls' shoes and play ball?" he asked me many years later when he sat down to tell me about his life for my book, "Like Father, Like Daughter." Bo was the fifth of seven children born in Pinsk, that small doomed city on the Russia-Poland border whose many Jews had been ravaged over the centuries by czars, Nazis, pogroms, hunger, political repressions and, always, hard times. (An eighth child was born in America, land of the free.) Bo arrived in America with his family in 1911, when he was four, and he spoke two languages. Neither was English. His father was a carpenter, who earned a hardscrabble living with his hands. "He probably wasn't the smartest man who ever left Russia," my father told me, "but you should be forever grateful he was smart enough not to miss the boat to America." He insisted that my brother and I get an education, but for him, quitting school in the sixth grade meant spending more time playing baseball at the National Mall, which in those days was more a place for sandlot games than a place to look for a museum or a monument. He was recruited as catcher for St. Dominic's Church in the parochial league, and his pals winked at one another when his name was entered on the roster as "Bregmanio," not Bregman. St. Dominic's won the city championship. When opposing coaches started making pointed inquiries about the catcher who looked more Jewish than Italian, the priest asked questions. And when he learned who Daddy was, he returned the trophy. His teammates didn't speak to him for a week, but he became so popular that his pals gave him the ultimate accolade: a nickname after Bo McMillan, who became the hero of poor boys on sandlots everywhere after he quarterbacked the Praying Colonels of tiny Centre College in Kentucky to an upset of mighty Harvard University, the (believe it or not) national champions. Alex lives a different life in a different time, but he dreamed a familiar dream. He might be on his way to Cooperstown. Alex describes his winning walk-off single in the fifth game as "something you dream about as a little kid." Here's to you, Alex. And, if I may, I like to think you're fulfilling Bo's dream, too.